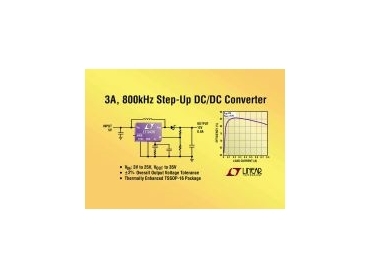 LINEAR Technology, represented in Australia by Braemac, has released the LT3436, a 3A, 800kHz step-up dc/dc converter in a thermally enhanced 16-pin TSSOP package. Its wide 3V to 25V input voltage range enables the LT3436 to operate from single cell Li-Ion batteries up to fixed 24V input rails, delivering outputs up to 35V. Its constant 800kHz switching frequency (synchronisable from 1MHz to 1.4MHz) allows designers to keep switching noise out of noise-sensitive circuitry and enables the use of tiny capacitors and inductors. The combination of the LT3436's high efficiency switch and thermally enhanced package provides high current boost capability in a very compact form factor, ideal for space-constrained applications. The LT3436 utilizes an on-chip, high efficiency 0.1Ω;, 3A switch. This includes all of the control circuitry required to complete an 800kHz, constant frequency, current mode switching regulator. Current mode control provides both fast transient response and excellent loop stability. Proprietary design techniques enable high efficiencies at high switching frequencies over a wide range of inputs, from Li-Ion batteries to 24V distributed buses. Maximum switch current remains constant at all duty cycles while synchronization allows an external logic level signal to increase the internal oscillator frequency from 1MHz to 1.4MHz. An operating supply current of 0.9mA maintains high efficiency even at light loads, while the 6μA shutdown current ensures extended battery life.